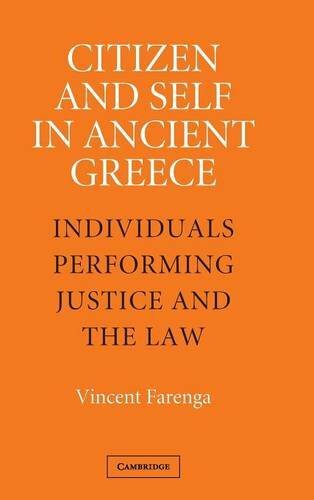 Citizen And Self In Ancient Greece: Individuals Performing Justice And The Law: 9780521845595 Hardcover - LIMEROCK BOOKS INC. Combining contemporary political philosophy with historical, literary, and philosophical texts, this study examines a series of remarkable individuals who promoted justice in early Iron Age, archaic, and classical Greece. From the earlier periods, Homer's Achilles and Odysseus were represented as heroic individuals who are also prototypical citizens, and Solon the lawgiver, wrote the scripts of statute law and the jury trial. The book's focus later turns to dialogues between a citizen's moral autonomy and political obligation in democratic Athens. How can the ancient Greeks help us define ourselves as both citizens and individual selves? This study looks to the ways the Greeks decided questions of justice as a key to understanding how our moral and political lives can be intertwined. Using Greek epic, law, drama, philosophy and forensic rhetoric over nearly six hundred years, it identifies the various "scripts" of citizen life that inspired different philosophies of moral individualism and political obligation in remarkable individuals from Achilles and Odysseus to Pericles, Alcibiades and Socrates.